I had the pleasure recently of talking triathlon with Keith Benline. Keith is a long time member and sponsor of TCSD as the owner of Robert’s Auto Service. Keith is passionate about giving back to the community as you will see. I am certain you will thoroughly enjoy getting to know this great guy! Craig: What activities were you involved in before triathlon? Keith: I was an All-Star Little League baseball player for Corona National Little League. After Little League, I made the baseball team for Auburndale Junior High School and thought I would be baseball player. My best friend and his cousin were guitar players, though, and kept asking me to learn to play the bass. So I decided instead of baseball to be a Rockstar, so I gave up on baseball during high school and pursued playing the bass guitar and singing. When my band got to play during the school lunch period I thought I had “arrived.” It was a surf band called Soundwaves and we were pretty popular from 1982 – 1984 in Corona and Riverside. People also knew us because of the cars we drove. The lead singer drove a 1966 Willy’s Jeep and I drove a bright orange 1975 Honda CVCC. My Dad loved those cars because no one knew how to work on them. We had 4 different Honda CVCC’s in those days. My dad taught me how to work on them and together we would keep all the cars running, rebuild their engines, plus work on the family boat and truck. So, as I entered my community college years, I had built a background as an athlete, rockstar, and auto mechanic. Craig: What led to your becoming a triathlete? Keith: After high school, I started to struggle a tad with my weight and so I started running. I would run all over Riverside (where I lived at the time) but mostly just for a workout. I loved the freedom that running gave me plus it always helped drop pounds fast. When I moved to Carlsbad in 1997, I started running along the coast and loved it even more, to the point I decided to sign up for the Carlsbad Half Marathon in 2000 and see how I could do. I ran a 1:33:30 for my first race and I was hooked. But, while training for my next race I dealt with a nagging injury on the inside of my left foot that would creep up my leg. It was frustrating and would not heal. It would act up about half way in my run then nag me for the next day. During one of my run attempts (it was Thanksgiving day in 2001 I think), I met a gentleman from Switzerland who was out running. I had seen him before and so I asked him if he had any plans for Thanksgiving. He did not so I invited him over to my house. His name was Christian. I told him about my injury and he recommended switching to triathlons so I could swim and cycle and take some pressure off my foot and all the running. We headed to the Carlsbad Pool a few days later to work on my swimming. The only lanes open were the “fast” lanes so we jumped in there and worked on our strokes. I could barely make it 50 meters without having to take a break. Suddenly we look up and there were two very fit male and female swimmers wanting to jump into our lane. I asked them if there were “fast” (because I would get out of the lane if they were) but they just jumped in and started hammering out laps. I was in awe as to how fast they were. They had names on their swimsuits. The guy’s suit had “McCormack” and the girls suit “Jones.” My friend from Switzerland was laughing at me because I had asked them if they were fast. He asked me if I knew who they were, but I had no clue. He informed me it was Michellie Jones and Chris McCormack and he was bragging about how Michellie took the silver medal in the first Olympic Triathlon because the Swiss girl beat her. So that was my first venture into the Triathlon. Craig: What are some memories from doing your first triathlon races? Keith: So after my first triathlon on a borrowed bike, I purchased a bike and started triathlon training. I saw the Tri Club had their local races at Glorietta Bay so I signed up. I had a short stint racing dirt bikes in the desert when I was 18 – 20. I wisely gave them up when I got married and raised a family, but the drive down to Glorietta Bay with my triathlon bike in the back of my Xterra so reminded me of when I used to take my Dad’s truck with my dirt bike in the back heading towards the race. The race went well and I’ll never remember all the talk back then about this new coach from Alabama named Mike Plumb who was fast and joining the Tri Club and that he was racing that day. I had met Mike earlier so I knew who he was. Well, when I got out of T2 and headed on the out and back run, about ¾ into the first mile here came the leaders back heading towards the finish. It was Anders Aannestad followed by Mike Plumb close on his heels. Mike’s face showed pain, determination, and grit and sure enough Mike made the pass that day and won. When I asked Mike about it, he said it’s all about pain management. And the second club race I did there was some guy that won the race that had the most goofy looking bike you’d ever seen. I thought maybe you have to have one of those bikes to go fast. I later learned it was none other than Craig Zelent. So then, we all went out looking for that “edge” that Craig had. I’ll never forget fellow Tri Clubber Tom Washington and I meeting up before those club races and trying race wheels and everything to compete, then realizing it isn’t just about the equipment and laughing about it. Those were great times! Craig: What was your favorite all time endurance race? Keith: I have 2 favorite all time endurance races and then one short distance race that almost killed me every time I tried it. The first all time endurance race was the Carlsbad Half Marathon. I think it was 2002 and I had Mike Plumb coach me. I hated him with a passion during those extremely hard track workouts and tempo runs he had me doing. But they worked. I ran a PR 1:23:30 and felt great the whole time, wisely drafting off faster runners. Drafting off Elvis and three beautiful athletic women at different times during the race helped. Then I signed up for my first Half Ironman (when Oceanside first became a Half Ironman) and all my friends told me to not even try for a sub 5 hour result on my first try. I had a PR of 4:53:13 and was so thrilled. It was really coming together. Then lastly, the hardest of them all for me was trying to break 18 minutes for a 5K. I ran 6 or 7 5K’s trying to beat that time, from the Carlsbad 5K, La Jolla Shores 5K, to a few different downtown San Diego 5K’s. I blew up so many times with only a few hundred yards to go. The closest I got was 18:02, so close. You have to run 5:45 per mile splits to beat 18 minutes on a 5K and for me it was more brutal then any of the long endurance races. I could run 6:00 per mile flat all day but as soon as I dropped below that it was brutal! Craig: What have been some of your most embarrassing sports moments? Keith: My very first triathlon was a backwards triathlon in Hemet. It was a 5K run, followed by a 12 mile bike, then a 100 yard swim in the high school pool. I thought to myself, “I could do that.” I had done no bike workouts at that time. Only swimming and running. I thought to myself, “How hard can it be to bike 12 miles?” So I borrowed a road bike from a friend who is a cyclist and off I went. I was 5th overall after the 5K (because my run speed was really improving) but I fell flat on the bike. So many people passed me. I really struggled. I had my swim speedos on under my run shorts. Once we got into T2 I pulled off my running shorts and started sprinting towards the high school pool. But something was wrong, something felt very wrong and it seemed everyone was staring at me. I then realized I felt like I was naked down below. I thought maybe I pulled my swim speedos off by mistake, but I looked down and nope they were still on. “Whew, I thought, only to feel naked again 25 yards later and have to relook down to make sure again. I finished the swim then noticed a strange numb feeling down below. I thought I had permanently injured myself. I was so relieved when my cycling buddy laughed hysterically and told me about numbness from not wearing padding and it would pass. The other most embarrassing sports moment was peeing my pants playing baseball in front of everyone. My dad was the coach and was adamant that everyone go to the bathroom before the game. Well, I didn’t. We were playing the Yankees, the #1 team and they got to bat first. I played shortstop and they scored like 20 runs in that first inning and it took forever to get them out. I had to go to the bathroom bad and wasn’t about to face my Dad, so, go I went, right there in front of everyone in my pants. I remember the kids on the Yankees pointing it out and laughing. It was really embarrassing. Craig: If you could waive a magic wand over the sport of triathlon, what would you like to change? Keith: It seemed that back in the day, triathlon was more of a unique sport. Those of us that participated in it were more casual about things and enjoyed the camaraderie amongst us. Jim McCann (former Tri Club President) was very casual yet did a fantastic job keeping us from getting to caught up in ourselves and handling situations. It was like we were an extended family. These days the sport has become more professional, serious, and seems to have lost some of that camaraderie from the early days. I know things change and the sport has grown tremendously which is good. I just loved the early days of the small Tri Club of San Diego before things got too big and serious. Craig: Who have been some of the most influential people or events in your life? Keith: Pastor Dave Bolton and Asst. Pastor Cheyenne Figueroa were a huge part of my life spiritually. I was raised Catholic, but had given up. They led me back to the Lord and helped me start my marriage and family on Jesus’ foundation, right at the time I was getting married to Kelly. Remember I was trying to be a Rockstar back in those days. Our band was trying to get signed by a record label and we were getting close. I decided to quit the band and focus on my Lord and my family. I then became the Worship Leader at the church for 7 years before moving to San Diego. Bob Cooper was an automotive repair consultant I worked for from 1995 – 2003 in San Diego. He was very influential on my business life and it motivated me to read as many business books as I could to help our automotive repair shops that hired us to do better. 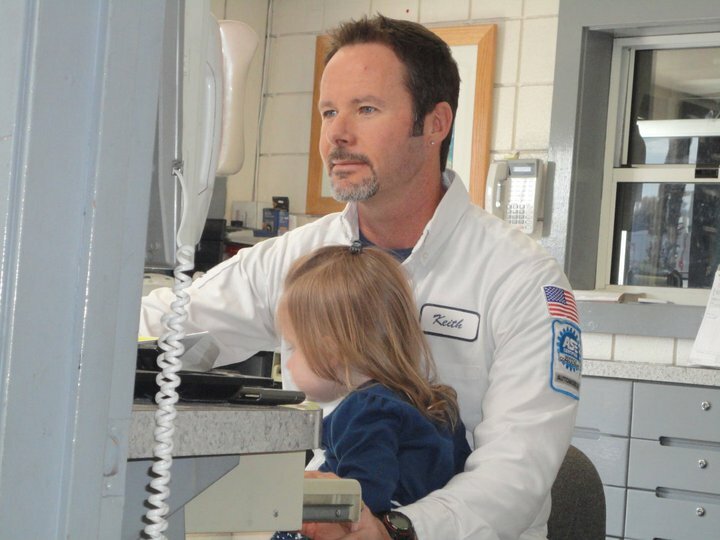 Craig: What was your career path before becoming the owner of Robert’s Auto Service? Keith: After attending Riverside City College pursuing business as my degree, I dropped out. I was too busy trying to be a Rockstar. My girlfriend’s dad at the time worked for a finance company. So I thought it would be a great career to be a branch manager for a finance company and work my way up. The pay was not so good, though. That’s when I met a drummer who was working for an oil distributor selling motor oil to automotive facilities. I was very familiar with automotive and engine oil having grown up working on cars with my dad and working on my own cars now that I was married. So I went to work for the oil company for more money and better perks. I was living in Riverside by March Air Force base and they had two openings, either on the other side of Los Angeles or San Diego. I chose San Diego. It was then I met Bob Cooper the consultant to automotive repair shops. After a few years I joined up with Bob to help shops and one of the first shops that I got to sign up with us was Robert’s Auto Service. Bill Clum was the owner and it was one of the most popular long time shops in San Diego. But Bill was getting tired and ready to move on so he kept offering me to either manage or buy the shop from him. My house in Carlsbad had sky rocketed in value and I was able to leverage the house and buy Robert’s Auto Service from Bill Clum in 2003 and then the land it sits on in 2005. With the years of reputation of Robert’s Auto Service (since 1969) and its family owned and operated focus, I knew I could take Robert’s Auto Service to the next level with my finance background and the business knowledge I learned from consulting. Combined with my mechanical expertise I knew I could make it work. Craig: What makes Roberts unique among the local auto repair shops? Keith: When I worked for the auto repair consultant, I noticed there were only a handful of well-run independent auto repair shops in San Diego. Robert’s Auto Service was at the top of that list. Anyone who has lived in San Diego, especially around La Jolla, PB, etc. knows about Robert’s Auto Service. It was started by Robert Martin in 1969 as Robert’s VW on Cass and Grand St in Pacific Beach. Bill Clum partnered with Robert shortly after and bought Robert out in 1974. Shortly after that Bill Clum moved Robert’s Auto Service over to the Bird Rock area right on La Jolla Blvd. Robert’s stayed there until about 1984 when it moved to its current location at 4630 Mission Bay Drive. Most automotive repair shops are run by mechanics who lack in communication skills, frustrating most people. I have strived to fix that and make sure communication and understanding are key between us and our customers. Our online reviews reflect this. I have always been a fan of the Tri Club and from the time I purchased Robert’s Auto Service I signed up to be a club sponsor. I wasn’t sure how it was going to be accepted because we are a non-triathlon sponsor but I figured people need their vehicles to get to their triathlons. Over the years I have used Robert’s Auto Service to help those in the Tri Club who go above and beyond to volunteer their time in the Tri Club. I have given them HUGE discounts to say Thanks. This includes, but not limited to former Presidents Gurujan Dourson, Jim McCann, Brian Long, Thomas Johnson, and Mike Plumb. Also coaches Bill Gleason, Jim Vance, and a few others. I also fix the Tri Club of San Diego’s van and keep it going no charge to the club! Robert’s Auto Service offers a 10% discount ($100 max) to any tri club member. I also make sure I oversee any Tri Club Member’s vehicle that comes in. I may not be here when the car gets checked in but I go through every repair order and find out who they are. If it’s a fellow Tri Clubber I make sure I go over the repair thoroughly and always try to greet and say hello when they pick their car up. Robert’s Auto Service is also an Approved Auto Repair facility through the AAA and we have over 700 5 star reviews! We care and we will always care. You can put your trust in us. Craig: How do you use your business as a ministry? Keith: So, after being involved in church music ministry, I noticed many Pastors and leaders in the church don’t get paid very much. So, just like I help those special people in the Tri Club who go above and beyond, I help Pastors with their vehicles. I have fixed / repaired many Pastors vehicles at no charge. It’s my way of giving to God. Some of the Pastors I don’t even know, they were referred to me so I figured it was God’s way of putting us together. A lot of these people could make money in the secular world but they have chosen the path of ministry to help people, and so I want to help them. It isn’t just Pastors. There are those who have ministries, such as my friend CJ who goes into prisons and ministers with Christian music and teaching to the inmates. Of course he needs his vehicle to get to these prisons. God has changed many lives of inmates who CJ ministers to. God has blessed me with Robert’s Auto Service, so I use Robert’s Auto Service to minister back! Craig: What is the prison ministry you are involved in and how do you think that helps people? Keith: With my music background, CJ has asked me to go with him into these prisons. I have been doing it on and off over the past 10 years with him. You would be surprised how many good men and women are incarcerated, that are good people who just made some bad decisions. God has reached into the heart of these men and women and changed them. I have been reading articles in the news lately with factual evidence showing the much higher percentage of rehabilitation of inmates who find God. I believe in that. Recently the Trinity Broadcasting Network (TBN) has been going through changes and focusing more on down to earth ministries and getting away from Televangelists. So they asked CJ to go into the prisons across America where they have their TV installations and put a “face” to the programs. CJ asked me to join him for one week up and down California on the tour bus to go in and play Christian music and minister. It was quite the experience. Especially when we ended up in McFarland and the Prison Chaplain was telling us all about the movie (about a high school cross country running team.) That was like God putting everything together. Craig: How has the prison ministry opened your eyes? Keith: The ministry has opened my eyes to who is in prison and how a few momentary bad decisions in their lives caused it. Yes, there are the really bad people that are in there. But there also husbands, wives, young men and woman who are really good people and just got a little off track. I realized quickly that but for the grace of God I could’ve made those few bad decisions. Some of them are so nice and polite, they just got caught up in drugs. They have worked hard at changing their lives to not have it happen again. These are the inmates that make the effort worthwhile. They are so incredibly thankful that we took the time to come out and visit them. Craig: What are your future goals? Keith: When I bought Robert’s Auto Service in 2003, my goals were to achieve a business that can run itself so I can support Pastors and Ministers and don’t have to worry about a “job” or “finances” per se. I have accomplished that goal but life also changes. For the past six years, my wife Kelly and I have babysat (and now homeschool) 2 of our 6 grandchildren who live in Bonsall by us. This keeps us pretty busy and I’m very blessed to be able to spend time with my grandchildren in the morning before I come into the shop. As far as triathlon, I get motivated when people like Bob Larsen (who has been coming to the shop for years) come into the shop and tell me what Meb Keflezighi is doing and then watch him win the Boston Marathon. That is very motivating. But with my life schedule and goals, I currently don’t race much. I still swim, bike and run, I just don’t race much anymore. Having set all my PR’s in my 30’s and 40’s and now dealing with an aging body (52) and things like a slightly bulged disc, I have to be smart and not let my ego get the better of me and make things worse. I did have a “bucket list” to get back and race dirt bikes like I used to and I did do that in the desert from age 48 to 50. But I quickly wised up about that as well and have since “retired” from that kind of racing. I plan on owning Robert’s Auto Service for a long time and continuing to use it as a ministry, sponsoring and helping the Tri Club of San Diego, and making sure we continue to earn everyone’s trust who comes in the door. So, until things change, I’m currently focused on raising grandkids, running Robert’s Auto Service, staying involved in ministry and giving back, and using triathlon as my fitness goals to stay in shape as my body ages. Craig: Keith, thank you so much for sharing your story. The work you do in the community with Robert’s and your ministry is very impressive and much appreciated by all whom you touch. We are all proud to call you our friend. This entry was posted in 2018, Running Race, TCSD Conversation, Triathlon and tagged Anders Aannestad, Bill Clum, Bill Gleason, Bob Cooper, Bob Larsen, Bonsall, Boston Marathon, Brian Long, Carlsbad, Carlsbad 5000, Carlsbad Half Marathon, certified coach, Cheyenne Figueroa, Chris McCormack, Corona, Craig Zelent, Dave Bolton, Elvis, Glorietta Bay, Gurujan Dourson, Hemet, Jim McCann, Keith Benline, La Jolla Shores, March Air Force Base, McFarland, Meb Keflezighi, Michellie Jones, Mike Plumb, Oceanside, Olympics, Riverside, Riverside City College, Robert Martin, Robert's Auto Service, San Diego, Switzerland, TBN, TCSD, TCSD Conversation, Thomas Johnson., Tom Washington, Trinity Broadcasting Network, USA Triathlon, Xterra. Bookmark the permalink.